Don’s post got me to thinking about just what “radical reliance on Truth” actually means. Is “radical reliance on Truth” simply a euphemism for “avoiding the use of traditional medical science”? Or does “radical reliance on Truth” mean something else entirely – something bigger, something more? I’m thinking that we need to be careful not to bury the talent of spiritual healing under the “napkin of its form.” Whatever means a person chooses to use for healing – whether it’s naturopathy, traditional medical science, Christian Science treatment, or something else – that’s the form, the means, the method. The morale, or essence, of spiritual healing is Love – Love is the power that heals and transforms us. The God I follow – Love, Truth, Life, Principle, Mind, Soul, Spirit (synonyms Mary Baker Eddy, the discoverer of Christian Science, gave for “God”) – isn’t concerned with what kind of treatment we choose to use – Love is going to remain unchanging Love, and Truth is going to remain unchanging Truth, no matter what form or method we use for physical healing. Truth doesn’t have an opinion on which form of treatment is best for treating disease – because Truth doesn’t know anything about disease, to begin with. Truth knows only perfection. And Truth and Love are synonyms, so doesn’t “radical reliance on Truth” also mean “radical reliance on Love”? When I choose to use Christian Science for healing I know my thought is going to be “elevated” by the experience, I know I’m going to gain a greater understanding of God and of who I am as her child, and I know I will be transformed – not merely healed physically – but transformed. I choose to turn to Christian Science for healing because it’s simple, natural, uncomplicated – it’s always available to me no matter where I am, or who I’m with, or what scrape I’ve gotten myself into “this time”. I choose to use my understanding of Christian Science to bring me healing because it has been proven to work for me. My motives for choosing Christian Science treatment for healing have nothing to do with a fear of what other Christian Scientists are going to think of me, or because I’m concerned God’s going to be angry at me, or because I’m worried about being ex-communicated, or because I’m opposed to something else, or because I’m scared of medical science, or feeling angry, self-righteous, or smug. My motive for turning to Christian Science for healing isn’t because I feel the need to take a “stand for Truth” – Truth doesn’t need me to take a stand for it – it’s not in some battle it might lose – Truth was Truth yesterday, and will remain Truth tomorrow – and nothing I do is going to change that. Truth doesn’t need me to side with it to continue to be Truth. I use Christian Science because it’s natural for me to do so – it’s natural for me to draw my thoughts close to Love, to wrap myself up in the power of Truth, to free my thoughts to dance in the celebration of LIfe. And it’s natural for me to experience healing by doing so. Well, dang. Have to make another apology. Ahem. So last week I had to go on the Science-Based Medicine website and offer an apology. Don’t ask. Just another one of those humbling experiences that I seem to so often have the opportunity to experience. And today I must send out another apology – this time to my fellow Christian Scientists. The apology from last week and today’s apology are actually connected – they’re both about a couple of laws in Washington State that allow parents to use Christian Science treatment without being accused of child neglect. Findings and intent — Christian Science treatment — Rules of evidence. (16) “Practitioner of the healing arts” or “practitioner” means a person licensed by this state to practice podiatric medicine and surgery, optometry, chiropractic, nursing, dentistry, osteopathic medicine and surgery, or medicine and surgery or to provide other health services. The term “practitioner” includes a duly accredited Christian Science practitioner. A person who is being furnished Christian Science treatment by a duly accredited Christian Science practitioner will not be considered, for that reason alone, a neglected person for the purposes of this chapter. In other words, if a parent has found that Christian Science treatment is the most effective treatment for himself and for his children – he won’t be prosecuted for using it. If it works for you, use it, right? Apparently, there is a question as to whether Christian Scientists even lobbied for these laws, or whether some politician decided to throw the exemptions in on his own. Who knows? In any case. I apologize for any misinformation I may have inadvertently propogated. Lately some individuals have been busy lobbying their politicians for exemptions for Christian Scientists from health insurance and laws regarding child neglect. And I’m sorry, but I have to ask – how is exempting Christian Scientists from health insurance laws and child neglect laws in any way going to help rouse anyone’s “dormant understanding” to the “apprehension of spiritual ideas”? How are these efforts for exemptions in any way going to help the cause and purpose of Christian Science, or make the world a better place? I am a Christian Scientist. I love what the study of Christian Science has brought to my life – the healings, the expectancy of good, the perception of creation as the expression of Love, Truth, and Life. I want to share the beauty of this way of life with the world. And so it seems to me a real tragedy that the lobbying and politicking by some Christian Scientists might be distracting people from seeing the beauty and healing power found in the metaphysics of Christian Science as a way of life, as a way of SEEING life. The efforts to reduce Christian Science to some kind of alternative health care system/religion is incredibly belittling to what I believe Christian Science to actually be – to the amazing potential, power, and purpose found in this way of life. Our society has biases. One of the biases is that traditional medical science is always the best and only way to treat a disease – and the fact that medical science is, according to the Journal of the American Medical Association, actually the third-leading cause of death in this country doesn’t seem to affect that bias at all. So I guess at some point I realized that what I needed to do was use my understanding of Christian Science to help ensure my sons never got sick to begin with, and to ensure that healings were quick if the sons did show signs of sickness. If a healing didn’t come quickly – and the healings usually did – then I brought the sons to the doctor. Common sense was my guide. I don’t believe it’s in the best interests of Christian Scientists, or of Christian Science, to be lobbying for an exemption to prosecution for child neglect. It makes Christian Science a target. Christian Science – as a movement with the power to transform the world – is deserving of better. Mary Baker Eddy, the discoverer of Christian Science, and the founder of the Christian Science religion, said that the “vital part, the heart and soul of Christian Science, is Love.” I’ve gotten to a place in my life where I find myself asking, “Is this coming from Love? Is this leading to Love?” And if it’s not, I don’t want to waste my time on it. Is asking for exemptions for Christian Scientists from contributing to health insurance, and from being prosecuted for child neglect, coming from a place of love? Or fear? Is it leading to love? Or fear? Don’t Christian Scientists have better ways to spend their time than lobbying politicians? Don’t Christian Scientists have a bigger mission, and a more important job? Oldest son is home from university for spring break. As I’m upstairs, working on some photos I’ve taken this morning, I hear him downstairs, practicing snippets of songs on the piano. I go down the stairs half-way and sit on the steps around the corner – positioned so he can’t see me – and settle in to listen. Soon he gets up and moves around and sees me sitting there – I’m busted! He grins. “Will you play some more?” I ask. “Sure,” he says – he is a good sport, my son. He goes back to the piano and I make myself comfortable on the sofa, stretched-out horizontal, eyes closed – and listen to the perfect beauty of Pachelbel. After a minute or two I open my eyes and glance into the dining room – and there’s the youngest son, finishing up a project for an art class. 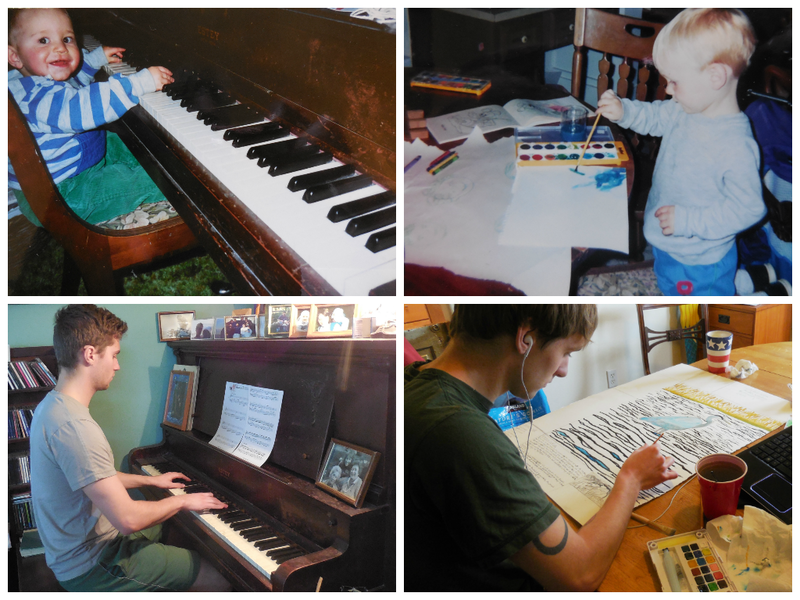 Two images flash into my memory: The oldest son sitting at the piano as a toddler, a big grin on his face; The youngest son on his knees on a chair in front of the dining room table, a paint brush in his little two year-old hand, creating a watercolor. Oldest son is three-fifths of the way through War and Peace. Something has just struck him – he’s been wondering why everyone is learning to play music in this book – and at first he’s thinking – why is it so important? And then it hits him – oh… yeah… if you wanted to share music with your friends 200 years ago, you had to be able to play it yourself! I am surrounded by expressions of Soul. I feel wealthy beyond description. A couple months ago, while visiting the Science-Based Medicine website, I made the acquaintance of a brilliant young medical doctor named Andrey Pavlov.I invited the folks at the SBM site to join me here at my blog, and Andrey has been good enough to pop in and visit with me. now and then. Some people seem to view internet dialogues between people with different perspectives as a sort of battle between bad guys and good guys, and winners and losers. But, for me, participating in internet discussions with people from a wide range of backgrounds has been a really useful learning experience. The internet has given me the opportunity to connect with fascinating people from all over the world. And Andrey Pavlov is one of them. Andrey has given me permission to share our dialogue here. I think you will find Andrey brilliant, articulate, eloquent, and well-learned – as I have found him. If I ever were in need of a doctor specializing in internal medicine, Andrey would be the kind of doctor I’d try to find for myself. I came here to quote your friend Kat in my comment over at SBM and saw this post. The relevant links are in that comment, but I thought I would comment here as well since this is precisely relevant. Have I just proven to you that unicorns exist? Because there is just as much support for my statement about unicorns as yours is for god. You commented that you “tried atheism” for a while. What does that even mean? Hemant Mehta talks about this in the case of a pastor who said he would try atheism for a year. But the point is that you then say that you couldn’t do it because you couldn’t deny this feeling, this belief you had. I find this sort of thing amazingly curious. I myself have never simply “believed” something. Even as a kid I never believed in Santa Claus. I only played along because I understood that’s how the game worked to get presents. I never believed in the tooth fairy – it was just a game to get a buck from my parents under my pillow. I read the bible as a child (I was actually baptised FWIW) as well as Greek and Roman mythology. They seemed equally plausible to me and I found the Greek mythology to be much more interesting. So in the same way that you simply can’t deny this feeling of “something” there that you must call god, I cannot fathom someone actually believing something to be true simply because they wish it to be so or feel that it must be so. That is just completely foreign and nonsensical to me. Don’t beat around the bush, my friend. Tell us how you REALLY feel. Okay, before I go any further, I just have to tell you that I really like who you are, Andrey. You crack me up. :) I also have to tell you that I never believed in Santa Claus, either – even though my mom tried really hard to convince me he was true. But comparing Santa Claus to the power I call “God” – that might work if I believed in some kind of man-god living in the clouds throwing down thunderbolts and mayhem on his creation, sometimes choosing to help his creation and sometimes choosing to not help. That kind of god really is like the Greek/Roman gods – that kind of god is not much different than Zeus. And I’ve always thought the story of Adam and Eve is really similar to the story of Pandora and her box. But Christian Scientists don’t believe in that kind of god, and we don’t believe the story of Adam and Eve is anything more than an allegory (Eddy refers to that story as an “allegory” in the CS textbook, and calls it all a lie). Christian Science should not be confused with “faith healing” or fundamentalist Christians – fundamentalist Christians would not like that very much, I’m pretty sure. I’ve noticed that a lot of times atheists seem to come from fundamentalist Christian backgrounds and they assume everyone else who calls himself a Christian believes the same stuff they were raised to believe. And this is just not true. In Christian Science God is, literally, Love. Eddy lists these synonyms for God: Principle, Mind, Soul, Spirit, Life, Truth, Love. There’s nothing supernatural about the Christian Science God – and there’s evidence for this God everywhere: kindness, honesty, beauty, intelligence – these are all expressions of my God. Why bother assigning the name “God” to Love and Truth? Because the power of Love and Truth brings healing. And I believe that’s the only kind of power deserving of the name “God.” I’ve experienced this healing power in my life time and time and time again. But I know could tell you my “anecdotes” until I’m blue in the face, and you wouldn’t be able to hear or accept any of them – so I guess it’s probably best if I just save you and me some time and energy and not go there. As I’ve learned how to bring my thoughts close to this power of Love in my life I’ve experienced healing – sometimes physical healings – but every part of my life has been touched by this healing power. It’s a practice for me. And it is not always easy. It requires a certain amount of discipline to keep one’s thoughts full of God, Love – and sometimes I really screw up. But I think I’m making progress here. Haha, I’ve no problem telling you what I really think. Same to you. In my view that is the only true sign of respect in this world – not beating around bushes or sugar coating things. My best friends are the ones who will tear my ideas to shreds and leave my writing dripping in red as they ruthlessly edit my work. My discussion of Mr. Claus was not intended to be a direct comparison to god. It was to illustrate an idea of believing something simply because we are told it is true or because we wish it to be. Your “god” is an identical thought process. Why must love be god? Why can’t it just be love? Why must healing power be god? Why can’t it just be the processes of complex molecular interactions which are explained so well (albeit incompletely, but with an amazing amount of knowledge under our belts)? You reference Eddy many times – I’m sorry, but the ideas about the physical nature of the universe by anyone back in the late 19th century are simply not a good source of grounding one’s current understanding. But especially someone who herself was not educated in any of the relevant fields at all. You do know that we have learned a lot since Eddy wrote her book, right? I mean a stupendousamount that makes ideas like Eddy’s and this notion of some non-physical “power” completely incompatible with the real world? Because the power of Love and Truth brings healing. That is at best nonsensical and at worst simply wrong. You do not need love or truth for healing to occur. It happens whether or not you have those things. In fact, there are studies that seek to answer this question. There have been numerous studies, well designed, to look at longevity, mortality, and outcomes based on subjective states and have discovered that it simply doesn’t matter. The most unloved miserable cancer patient still has the same response and healing as the most loved and supported one (assuming, of course, they have equivalent medical care for their cancer). So what does it mean to say that “Love and Truth brings healing?” And how is “Love and Truth” different from “love and truth”? These are simply nonsensical concepts to assign subjective meaning to processes that are already going on and will happen no matter what. Not quite. I would hear and accept them. I believe them to be true and that your story is correct (at least to the best of your recollection). But where we would differ is in the interpretation of what they actually mean. You would say that your anecdote shows that “god” (however you define it) “healed” you. I would say that the same exact “healing” would have happened regardless of your “god.” So how do we settle our difference in interpretation? We can’t go back in time and have you do something different and see if it yields the same outcome. Which is why anecdotes are simply not convincing evidence – there is no possible way for you and I to settle our different interpretation of the events. Based only on that anecdote we are at an impasse. So we do science. And we look at multiple people, over varied conditions, investigate the question, and see if there is any difference depending on the variable in question (in this case the “healing power” of your “god”). And, put plainly, the question has been asked many times in many different ways and the answer is always a resounding no, there is no “healing power” of god out there. Of course, the common response by the believer, convinced by his/her anecdotes, is “well, my god is different” and “well, your science can’t test that but it worked for me.” Which is essentially special pleading and begging the question. There are simply much more plausible answers out there than what your interpretation is. Your comment is also internally inconsistent. God is not supernatural yet doesn’t act through physical means. What is that even supposed to mean? If it isn’t physical – if it isn’t testable by science – then it leaves the realm of naturalism. Merely asserting that it is “supremely natural” yet doesn’t act through physical means doesn’t make it so. And is a philosophically unsound position to hold. It requires a certain amount of discipline to keep one’s thoughts full of God, Love – and sometimes I really screw up. Now this is where I personally find these sort of ideas quite terrible. Because what you have done is not only set up a way for your claim to be completely unfalsifiable but also a way to blame yourself for things you deserve no blame for. If your “power of healing” through god fails then you simply weren’t keeping your “thoughts full of God, Love…” enough. Which means I can never prove that you are incorrect because you can always throw up that excuse whenever something fails and it means that if you were, for example, to get cancer that would be a failing of you when in reality it is just a facet of the random nature of the universe. Andrey, I always finish reading your posts with a big grin on my face. I am not sure what this means. I think it’s a good thing, though. I’ll have to preface this by saying it will have to be a little brief and perhaps not fully thought out and will also be my last response of the evening; I am shortly going to be heading out to go watch and photograph the Krewe de Vieux parade to celebrate the opening of Mardi Gras season here in New Orleans. I had not heard of Cousins. Nor that specific study you linked to. My thoughts, however, are rather simple – first and foremost the study shows a correlation not a causation these are vastly different things, particularly on this topic. Of course being happy correlates with overall better health outcomes (and the converse is true as well). People who are happier tend to engage in more healthful behaviors and take better care of themselves. They drink less, do less drugs, smoke less, exercise more, eat better, and so on and so forth. I also personally believe that we as physicians should be very cognizant of the state of mind of our patients. Just because a miserable cancer patient has the same outcomes as the happy ones doesn’t mean there isn’t intrinsic benefit to trying to make our cancer patients happier. Plus, we get better outcomes. Why? Not because those emotionsdirectly lead to healing but because a happy cancer patient is likelier to follow through with all treatments, eat more and better, etc. I am actually all for having something like a day spa/salon in chemotherapy suites so people getting their chemo can get a massage or beauty treatments. I may be the pedantic materialist scientist but I am a physician because I want to care for people. That includes their psyche as well as their physical well being. After all, I am quite convinced there is no afterlife and this short, fleeting nanosecond of life we have on the cosmic scale is all we’ve got. I can see no higher goal or purpose than to make that life as objectively and subjectively as good and positive as I can. But I digress. The point is that there are a few cases where emotions can actually have a role in disease states directly – basically anything that would be affected by catecholamine levels induced by anxiety. So heart disease, high blood pressure, and functional GI issues can certainly be affected by our emotional state. Chronic anxiety can itself directly lead to physiological changes from excessive exposure to catecholamines and corticosteroids. They can also make an acute crisis worse. The prime example is a heart attack. We give you pain meds when you have a heart attack until you are as pain free as possible. Why? Because we know that pain causes stress and anxiety which leads to increased catecholamines which in turn act to potentiate the heart muscle to contract more oftenly and more forcefully. Since your heart is not getting blood, that means quicker death of tissue. So we try and modify that to buy us time; basically like how you can hold your breath longer under water if you are calm and relaxed than if you are freaking out and struggling. So from a rigorous scientific perspective yes, you are right – “emotions actually play a huge part in one’s health.” But they do notcause healing which is a different statement and is different to what I was addressing..
And I have to tell you that I think you’re having the same feeling I had when you guys on the SBM site started talking about the “Nirvana Fallacy”… medical science can’t guarantee its results… and if I expect a guarantee before I hand my child over to the medical profession, I’m told that I can’t be given that guarantee and to think I can is part of the “Nirvana Fallacy”… which… yeah. I’ll admit that saying CS doesn’t always work for me because of my own inability to use it correctly is kind of a lame argument, if you’ll admit that the whole “Nirvana Fallacy” is kind of lame, too. Sorry for the long delay. With Mardi Gras parade prep and whatnot I got very busy and it slipped my mind to respond for a few days. I can understand that feeling. To you I suppose it must seem that there is some sort of equivalence here and that I am just unreasonably favoring my interpretation over yours. That I am faulting your worldview for the exact same thing that I am not faulting my worldview for and that would be dishonest and unfair. Except there is a fundamental difference. When I say that medical science can’t guarantee results and nothing is 100% certain that is a reflection of both the limits of actual knowledge and the fundamental nature of the universe. I actually read an article just yesterday over at Jerry Coyne’s blog WEIT which brought up some clarity for me and perhaps could be helpful for you as well. You see we actually do argue about what the scope, purview, validity, and reliability of our methods are. We (well some of us, anyways, myself included) are interested to know what the practical, philosophical, and epistemological powers and limitations of science actually are. We aren’t just blindly asserting “Our worldview is correct, because we say so.” We investigate it, and discuss it, and argue it. And one thing that is clear is that methodological naturalism – which is a necessary aspect of the philosophy of science and required for the field to be epistemologically valid – works really well. I don’t know how much you are into this particular field, so I hope I don’t insult you by explaining it. But in a nutshell, science makes the assumption that everything it investigates must be natural, exist withinthe physical realm, and be empirically verifiable. If something is claimed to “break” the laws of physics, or be “unassailable” by science, then science is necessarily blind to it. It is Sagan’s Fire breathing dragon in the garage. So you see how you can retreat from scientific inquiry until your dragon – if it exists – may as well not exist. Because you have to define it in such a way that it cannot be tested… which means that it has absolutely no effect on the real world that you and I occupy. You could posit all sorts of things like it is part of a higher dimensional realm that in principle can never possibly interact with our realm. And I might say – OK, that is conceivable, but very unlikely given what we know, and even if it is true that means it cannot, by definition, matter to us in any possible way. From this, stems the idea of philosophical naturalism. Which means to say that not only things amenable to science are natural, but everything is natural. Which is impossible to actually prove definitively, but as a working philosophical outlook is still valid with only one assumption – that if it is, by definition, not possible to interact in our physical realm then it simply cannot possibly matter to us and for all possible meaningful purposes does not exist. So how does this tie back to the Coyne article? Because the author he is reviewing makes a good point. Science has shown itself to be not only by far thebest but also the only way of knowing things about the world and universe. But there are other ways of understanding. Art, literature, poetry, music, mathematics, even religion are all different ways of understanding the universe around us but notvalid ways of knowing about the universe. They cannot generate knew knowledgebut can only take knowledge we have (or believe we have) and go from there. Math, for example, is an entirely human construct with multiple different systems devised. Many of these systems are completely interchangeable (for example hexadecimal vs decimal are identical, except that computers process better in hex than base 10 because they are binary systems) and some of them are very specific to the application they are intended to look at (imaginary numbers or the various non-Euclidean geometries). But they cannot generate new knowledge because they must be empirically verified to see if they actually describesomething real and useful. And so you make predictions, write out equations, run tests, and see how well they match up. If the predictive power is good then we know we have a good equation, mathematical system, or theory. If not, we scrap it and move on (or at least we should, we get stuck on bad ideas sometime). So now that we have all these ideas in our head, how the heck does that relate to your simple initial question about the Nirvana fallacy and my claim that you can always escape inquiry by just changing your parameters? Because when medical science can’t guarantee something it is because we know the limits of what we know and what we can do. We don’t change the parameters after a question is asked or something happens to explain what happened. And if you challenge us we can tell you what will prove us wrong. We are predicting possible outcomes, not saying that we can’t predict it and then when a bad outcome happens making something up to explain it. So medical science isn’t saying “Well, crazy stuff happens and we have no idea what the outcomes can possibly be.” We say, “This is the case. Based on this knowledge, to the best of our current ability, we can say that there is a [x]% chance of a favorable outcome, [y]% chance of this bad outcome, [z]% chance of this other outcome, and that leaves a small percent of unknown which could be any number of bad or neutral outcomes but that is the limit of our knowledge.” In other words, we tell you up front what to expect and that includes uncertainty. Depending on exactly what the question is we have more or less uncertainty. Type I diabetes in a child is a death sentence and we know how to treat it. Full stop. A suspicious lump in a woman’s breast that hasn’t been histologically examined and fully characterized… sure, that could be any number of things. So when it goes away that may seem surprising if you assume it is one thing – cancer – and don’t consider anything else. But for me, it is entirely unsurprising because I know how many other things it can be, how common cancer actually is, how common it is in women of a specific age with specific signs, and that about 20% of breast cancers spontaneously go away. That is why I don’t find your anecdotes (or any) to be convincing. Because to you they seem profound, but to me they are precisely what I would have predicted knowing what we know. The difference with CS (and religion in general) is that you make a claim, then when something not predicted by your claim happens you just write it off as anything other than your claim being wrong. You claim that CS can do certain things. When those things don’t happen, instead of thinking “Well, maybe CS doesn’t actually work and isn’t actually valid” you assume that it must be a poor practice of CS or something else. Which it very well could be, if we are just looking at individual anecdotes. I can’t prove that isn’t the case but you can’t prove it is. So how do we settle it? Well, by the only method of generating new knowledge that we have. We can’t use poetry, art, religion, literature, or math to help us figure out this knew knowledge. They can only take what we already know and try to interpret it. So we must use the methods of science. And we have and it has shown that things like CS and religion simply don’t work. They do not affect anything in the real world (with the sort of caveat regarding subjective feelings and how they are tied in to health that I made before, but that is a different category and not relevant to the point here). If I make a claim about your illness and something else happens, that casts doubt on my claims. Perhaps I don’t understand the illness well enough or perhaps I missed an important part or perhaps I misdiagnosed you. But I don’t get the “out” of simply saying that I am still right and then making up an excuse. And that is the fundamental difference and why it is not a Nirvana fallacy or unfair to say that your excuses for CS are not valid while the known, described, and acknowledgedlimitations of medical science are reasonable. I want to think about this some more and come back with a worthy response. Or as worthy a response as I am able to give. For right now, let me just say this, though – when I was a mother of youngsters I wasn’t so much interested in methodology as I was in results. I wanted my kids to be healthy. As I mentioned there were only two times I can remember when medical science brought them positive results – when one of my sons was diagnosed with pneumonia, and when the other one fractured his arm. As for myself – I can only remember one time when medical science actually helped me – and that was when I broke my arm high-jumping as a youngster. All the other health challenges I’ve experienced in my 57 years of life have been handled pretty quickly and effectively through my understanding of Christian Science. If CS hadn’t helped me all these years, you can be sure that I would have found something else that did. I ain’t no martyr for religion. And I should probably add that I’m also not worried my God will be offended or affronted if I turn to medical science.- .I don’t think God – the one I believe in, anyway – has any preference one way or the other. I don’t think God has any thought about that stuff at all. And I think when we try to attribute human opinions and preferences to God then we’re anthropomorphizing God. Trying to put God inside some kind of human framework, and limiting God. Love just keeps on being Love, and Truth just keeps on being Truth – and unchanging Love and Truth (God) aren’t affected one way or the other by what humans do or think or opine or prefer. That’s what I think, anyway. The difference is that the two arguments are not the same. We are up front saying we can’t guarantee a specific outcome and explaining why and explaining what the possible outcomes are. That is vastly different than saying CS doesn’t always work because of your inability to use it correctly. We are saying that even when used correctly we have characterized the failure rate, understand why failure happens, and do our best to minimize it. We also admit the limits of our knowledge. We actually do know how every force relevant to us works and things like CS – no matter how the specifics are characterized – simply violate that understanding. You may wish to disagree that we have this understanding, or wish to claim that since we aren’t 100.00% certain of it that there is still room that CS (or whatever type of faith, prayer, love, god, whatever, healing) could work in some here-to-for undescribed manner that will upend the knowledge we do have. But a 7-sigma certainty is just about as certain as we can possibly ever be in this universe of ours. And I’ll take a 99.9999999999999999% certainty (which is how sure we are about those relevant laws of physics) any day. I can understand why the two may seem superficially similar, but my longer comment addresses that as well. They are only similar if you force them to appear similar because the only alternative is to realize that these nebulous concepts of “god is love” and “love is healing” don’t actually tell us anything about the universe around us. They just substitute words with overlapping meanings to obfuscate reality. This response was good, too. I’m going to ponder that for a bit before I respond. Wonderful response, Andrey! Really articulate and well-written. I’ve been sharing parts of your responses with some of my friends, and they, like me, have been impressed with the logic of what you write. Thank you for the kind words. My goal is to believe things because of good reasons. I like to think that if I do my best to explain those reasons, others should believe the same things. That is a big part of why I am interested in the dialogue with you. I like testing my own ideas and myself, as well as my ability to convey them in a meaningful manner. I seem to be having some success with you which is encouraging to me. You are also someone with whom it is possible to engage in conversation despite our rather fundamentally different world views which is not so common. Normally such conversations eventually degrade to “lalalala… faith! your science can’t tell me everything! I’m going to believe whatever I want anyways, even the stuff you’ve clearly shown to be false” and that is it. So thank you for being willing to engage and allow your ideas to be challenged at all. I also want to take a second to point out that I am capable of and am willing to change my mind. I have done so many times in the past. It may seem from your perspective that I am unwilling because I consistently find your arguments unconvincing. But I have, FWIW, spent a lot of time reading, thinking, and analyzing these sorts of arguments and already done the work to understand the fundamental nature of them. You could surprise me and give me something new. But after literally years of study and countless hundreds of hours spent on religious apologia of all kinds, one thing has become obvious – there aren’t that many arguments out there and even fewer novel ones. So my responses and comments are not intended to be dismissive. But I just wouldn’t be making them in the first place if I didn’t have very good reason and evidence for them. LOL. In medical school a had a few people comment how annoying it is that I am “always right.” The fact of the matter is that I am not always right. But if I am going to open my mouth and make a claim in front of a bunch of people it will be when I damned well know I am right! We call that “selection bias.” I give the impression of being “always right” by holding my tongue when I think there is a decent chance I may be wrong. One time in particular is still quite funny to me. In 2nd year of med school we had small group sessions of 10 people with an attending physician leading the discussion. One of the others is someone who I am more friends with than others, but also happens to be extremely full of himself. In fact another friend made the hilarious smack-down comment that “I wish I could love anything as much as John* loves himself.” So one day he makes a claim about the watershed region of the hindgut which is simply wrong. I call him out on it and he is insistent and veryconfident. I don’t back down and absolutely refuse to let him try and argue that we are somehow both right. So after a few minutes our group leader moves things along in the interest of time and he proceeds to furiously type away at his keyboard for another 10 minutes, shooting me glances from time to time. Then his face scrunches up, he closes his computer, and rejoins the discussion. Someone else in the group made the comment of “how are you always right?” Simple. I wasn’t going to risk making of fool of myself in the group by being so staunchly unbending unless I really, really knew I was right. And so it is for the types of discussions we have been having. I will admit (and have) when there is uncertainty, when it isn’t something I am supremely confident in, and will avoid waxing poetic just for the sake of it. But in questions regarding religion in general, the idea of intercessory prayer (or activities similar to it), the logical fallacies and cognitive biases that can predispose us to interpreting things incorrectly, and so on… I’ve done my homework. So please don’t take that as arrogance – I just know where my knowledge and expertise lays. I look forward to it. I will give you the best response to that that I can. My anecdotes usually have a purpose, in addition to my own penchant for being a raconteur. This is an example of selection bias. Medical science has only helped you those few times because those are the only times it was in a position to do so. From a combination of many factors – your own beliefs that most things can be healed through CS practices, a couple of bad experiences with medical science, what I argue is a false interpretation of the data of certain of your anecdotes, and the fact that in general and for the most part most people don’t actually need direct and active medical intervention to live a reasonably healthy and robust life. Medical science has provided us with lots of things to obviate the need for much direct medical intervention. Don’t forget that public health is a subset of medical science writ large and that you benefit from that regardless of your own proclivities for engaging the services of a physician. You have clean water, a secure food supply, the people around you (and hopefully you yourself) are vaccinated, you know basic steps for safe handling of food, you refrigerate your food, and so on. You won’t end up in an ICU with polio because we eradicated it from our country through medical science. But 60 or 70 years ago, you had a very good chance of contracting polio which would have left you crippled, dead, or in the hospital regardless of your beliefs and predilections. In short, mistakes in thinking about such thing have much less penalty than they did 50, 100, and further back in the past. So let me give you an example. You get a “stomach bug.” Norovirus is a common one. Gives you diarrhea, some vomiting, makes you feel crummy and nauseated. The vast majority of the time you will pull through it with absolutely no issue at all. You deal with the symptoms, drink plenty of fluids, and recover. But what if you didn’t have access to those kinds of resources? One of the top 3 causes of childhood mortality in the world is diarrheal disease. That is because most of the world is developing and doesn’t have those basic public health initiatives that you benefit from without even needing to be consciously aware of them. You could also have a particular nasty case and become so dehydrated and electrolyte depleted that despite those resources you could die. In our country that is very uncommon, but it does happen. In which case you would need to come visit me so I can put in an IV and rehydrate you, get your electrolytes in balance, and support your kidney function until you recover. But what if you came in early and were otherwise doing fine? I would tell you it is likely viral, likely self limiting, and send you home with advice on when to return and how to self-treat. I might also write you a prescription for an anti-nausea medication just to help you feel better as you recover, since being nauseated is a terrible feeling. Would you say that medical science didn’t help in that scenario? By all counts you could have completely skipped coming in to see me, recovered just fine, and argued that it was your CS treatments that took care of the issue. So do you see how this selection bias could play into a confirmation bias? Because you are lucky enough to be born an Untouchable in the ghettos of Delhi you are very unlikely to contract an illness that would legitimately threaten your life. So the times you do, it goes away on its own, you do whatever you normally do, and then give credit to CS. The danger is when that uncommon case occurs and because you have grown to believe that CS will take care of it you delay treatment until it is too late. Perhapsyou wouldn’t do that, but it is unquestionable that it happens. The other danger is consequences not yet seen. You could recover from the Norovirus and the misery of those 2 weeks will fade in your memory. But the kidneys are exquisitely sensitive to volume status, so you ended up damaging them. But not enough to cause an immediately noticeable problem. But later in life, something else comes along and because you started with slightly damaged kidneys, you have less reserve and this tips you over the edge. What would have been completely trivial now leads to kidney failure. But until you are confronted with something so dramatic, it is incredibly easy to just go on assuming that everything is fine and that CS is consistently “working.” Which is what I meant when I said the penalties for erroneous thinking in our society are not strong enough to force you to think otherwise (which is a good thing, btw. I want people and their children to not have to worry about dying constantly like they do in developing nations). And that is also what I meant when I said religion and other things give you ways ofunderstanding but not knowing. We both have the same empirical data point – you survived a Norovirus infection. But my interpretation of why and what that means will be different than yours. And I think when we try to attribute human opinions and preferences to God then we’re anthropomorphizing God. Trying to put God inside some kind of human framework, and limiting God. Love just keeps on being Love, and Truth just keeps on being Truth – and unchanging Love and Truth (God) aren’t affected one way or the other by what humans do or think or opine or prefer. That’s what I think, anyway. Andrey, I find I cannot disagree with anything you say here. And perhaps “God” IS nothing more than my own consciousness of good, really – but I feel this Good as a presence in my life. I’ve felt it. It’s as real to me as the air I breath. It speaks to me – not in a man-voice – but… it speaks to me as Truth. As Love. In times when I’m scared, I feel this presence of Love and comfort around me – and, again, maybe that’s nothing more than my own thoughts – but whatever it is – whether it’s just my own consciousness – something inside me – or whether it’s something I am inside of – this power I call God has been with me when I’ve been sick, and when I’ve been scared, and when I’ve had to make important decisions in my life – and this presence has helped me. You talk about prayers of “intercession” – and others have lumped Christian Scientists in with “faith healers” – and that’s not what my understanding of Christian Science is at all. I don’t ask God to intercede on my behalf, of fix stuff for me. I don’t rely on some kind of blind faith. God doesn’t have to do anything or be anything but God, Love. And, I believe, we can all find healing when we draw our thoughts close to this power. But… yeah… this probably just sounds like so much gobbledy-gook and mumbo-jumbo to you, doesn’t it? And, of course, if you ever want to talk about God-stuff and medical-stuff with me, you can always find me right here. Andrey, I find I cannot disagree with anything you say here. Well, I suppose that is a good thing then. Even though in re-reading what I wrote now I made a few errors where I dropped a word, but hopefully the meaning was still obvious enough. And perhaps “God” IS nothing more than my own consciousness of good, really – but I feel this Good as a presence in my life. I’ve felt it. It’s as real to me as the air I breath. It speaks to me – not in a man-voice – but… it speaks to me as Truth. As Love. In times when I’m scared, I feel this presence of Love and comfort around me – and, again, maybe that’s nothing more than my own thoughts – but whatever it is – whether it’s just my own consciousness – something inside me – or whether it’s something I am inside of – this power I call God has been with me when I’ve been sick, and when I’ve been scared, and when I’ve had to make important decisions in my life – and this presence has helped me. This is interesting to me. I believe you, I really do. I absolutely believe that you have these experiences and feel the things you do as you say them. And I do not think these are evidence of any sort of psychiatric illness, cognitive dysfunction, or anything someone may call “abnormal.” I don’t really know (nobody does) but there is plenty of evidence to lead us to think that this is simply one of the many fluid ways in which an individual processes the universe around them. It is, IMO, important to realize that everything a person sees, feels,experiences in any way is highly processed by the software and hardware of our brains. We (mostly) all agree that an object which reflects electromagnetic radiation with a wavelength of 650nM looks “red.” But how do I know that what you actually experience as “red” is actually what I experience as “red”? I can’t know and you can’t know. That is what philosophers refer to as the “qualia” of life – that purely internal subjective processing and experience of life and the universe through the consciousness we have. It raises this interesting idea of “p-zombies.” Dan Dennett has written a fair bit on them and it stems in part from the concept of a Turing test. Suppose you build a robot that has an artificial intelligence. We have those in existence so it should be so hard to imagine. Now, let’s say that you can’t see this robot (so that you can’t tell just by looking that it is a shiny metal robot) but you can ask it any questions you want. You can pass it objects and ask it what it is, what color it is, if it is warm or cold, etc. And it will answer. You can imagine that at our current level of technological sophistication you would be able to figure out reasonably rapidly if it is a machine or a human. But lets pretend that the machine is sophisticated enough that no matter what question you ask it or what challenge you pose it, it answers in a way that makes it completely indistinguishable from a human being. In other words the AI of science fiction movies. Does that AI experience qualia? If it says “I feel sad” does it “feel sad” the way we do? Would it “feel” love like we do? I think many people – religious ones in particular – would say no, because it is a machine. But many philosophers, and myself, believe yes it would. For all practical intents and purposes it would. Because I don’t know that you “feel sad” the way that Ido. I can only take you at your word and accept that you are conscious and feel sadness and pain. And I know that consciousness can be missing oradding qualia that I different to yours and mine. Psychopaths do not feel guilt and remorse like we do. Synesthetics see colors associated with specific words (if you don’t know about synesthetics, you should look up a documentary on them; absolutely fascinating stuff). Are they more or less “conscious” than you or I? Not by any meaningful metric. So when you say that you “feel” the presence of Love, Goodness, etc. I believe you. I can’t possibly imagine what that means in the same way I can’t imagine what it means when a synesthetic says that someone’s name is “lime green” in color. But to that synesthetic, it is a consistent, meaningful, and very real experience. The same way I couldn’t imagine what it would be like to torture and kill someone and feel absolutely no guilt or remorse over it like a psychopath. These are both experiences completely outside of my ability to experience. Those are extreme examples, but there are more subtle ones. I can tell you that my fiance experiences things differently and often more profoundly than I do. I actually wish I had her subjective experience of things since it seems so much more fun! It would be cool to be a synesthetic as well, but I’d rather not be a psychopath… even though the psychopath has no regrets about being one! Even then, psychopathy is a spectrum and you can have varying levels of guilt and remorse. And there is literature – and currently one “out” individual blogging – about being a functional psychopath. They are often people in power, who ruthlessly climbed the corporate ladder because they had no compunction about doing so. But they aren’t insane so they realize that to flourish they must constrain their activities so as not to be booted out of society. Being a psychopath doesn’t necessarily mean being evil. I don’t ask God to intercede on my behalf, of fix stuff for me. I don’t rely on some kind of blind faith. God doesn’t have to do anything or be anything but God, Love. Then you aren’t doing anything that is relevant to me or anyone else in the universe. You are just adding a flourish of qualia to your experience of reality that I don’t have similar to how synesthetics add a flourish of color to names and objects as they experience them. But here you are beginning to tread on something empirically verifiable. You are positing a change in physical reality (healing) via an action (drawing thoughts closer) to something (a power). This is something we can test both directly and indirectly. We can look at the ultimate outcome – healing. We take a bunch of people who think like you and feel they are “closer to this power” and compare them to those like me and see if there is any measurable difference in healing. You can define that in any way you like and test it. And we have done some tests on that and found that there is simply no measurable difference. We could also look at the physics involved. Power is an empirical term, especially when you use it in this context of it having an actual effect (healing). And thanks to the core of the Standard Model of physics being complete, we can say that there simply cannot exist such a power. What physics tells us to a 99.99999999999999999% certainty is that there is no such power that can conceivably act on us in any meaningful manner. We know literally every single force that can possibly act on a scale remotely relevant to us and that is not in there. There are forces (remember mass=energy=force=power) that we haven’t yet described. But unless the Standard Model is wrong (which is a 0.00000000000000001% chance) then they are either too weak to do anything on our scale or act on such a short distance that they cannot do anything on our scale (meaning that if we could possibly be reached by the force it is so weak it can’t possibly have an effect or if it is strong enough to have an effect it can only act on sub-atomic scales, so it can affect quarks, gluons, boson, but not whole atoms and molecules let alone people). So while I believe that you feel these things and that they do bring meaning to your life, they simply cannot actually have the real-world empirical effect you are claiming it does. This conversation is really helpful to me, Andrey. It’s helping me better define my own beliefs and thoughts about stuff, and I thank you for taking the time to talk with me. I’m glad to hear that. It is helpful for me as well. I have no problem with people enjoying the qualia of life however they do. I would love to be able to actually experience what it is that you call God, but I can’t. I also have my own experiences BTW. When I go out and see an amazing rainforest, for example, I “see” the flow of energy and the biochemical reactions making it happen. I can visualize the photons of light hitting photosystem II in the chloroplast and energizing an electron to cascade down and produce energy to combine carbon dioxide into glucose, to produce energy for molecules to organize and arrange into the tree in front of me. I find it awe inspiring and appreciate the beauty of it all as well. But I also recognize that I find it beautiful because I also arose from the exact same processes and alongside all the other life on our planet. And I find that even more profound to the point that it just gave me a chill and made my scalp tingle and my arm hair stand on end as I wrote this. Finding out these processes, how they work, how they got us here, and how to manipulate them for preferred rather than random outcomes is what science is. After that we can use that information to decide how best to manipulate those processes and to what end. In that realm, the diversity of thought and experience (qualia) is vitally important to us. Because the science gives us the knowledge but everything else about us gives us the understanding on what to do with that knowledge. In a just and equitable world, we take that into account and don’t flippantly discount someone’s understanding and qualia just because it is different to our own. BUT…. that means we have to agree where those fundamental processes end and our qualia takes over. Because history is rife with examples of people taking their qualia and using it to barbaric ends. The “God” that someone feels is real and is there is most oftenly anthropomorphic, can and does intercede in our lives and at our behest, and usually tells people ways that others should live their lives (like gay marriage is evil, for example). I assume you would think that discrimination against gay marriage is not right and the views of those who think that should not be imposed upon those that don’t. Well, to those people they “feel” that their god is just as real as you do but take that understanding differently and use it to impose their subjective ideals on others. And that is, overwhelmingly, what religion actually is and does in this world. Not yours, at least not to a large degree (it would seem), but the vast majority of others. So when you make the empirical claim about healing and the power of your god, regardless of how you phrase it, that is an empirical claim and I believe it is important to understand that and also why it is a false empirical claim (as I explained above). Also note that even though you say you do not ask your god to intercede since you would find that silly, you are effectively doing exactly the same thing. What is the real difference between Joe Christian asking his anthropomorphic god to heal him vs Karen CSist “moving your thoughts closer to the power that is god” to heal you? Anyways, this is probably long enough for now, but hopefully makes some sense. As for the google group… thank you for the invite, but I have never done any of those and probably shouldn’t expend more time on this than I already am. I tend to get sucked into these things (as you can tell by how much I write) and I have other, more pressing, things to do. But I will keep it in mind. I have a couple friends who experience music in color – which is kind of cool. I remember when I was in high school it came to me that there was no way I could know if what I call “green” or “red” is the same green and red that other people see – and I’m glad you brought that up here. I have never heard the word “qualia” used before – the idea of “qualia” in relation to my experience of “God” really intrigues me. Wow. Yeah. Perception. Interpretation. Subjective vs objective. This is really interesting to me. “‘Rock of Atheism’…hmmm, not as catchy as ‘Rock of ages’, but I kinda’ like it. “Bringing my gaze earthward, I am rewarded by a spectacle of such complexity and diversity that I am staggered. How can anyone ever be bored, immersed as we are in a world so brimming with life? It’s everywhere, a ceaseless drama of conflict and co-operation, always striving to fill every gap and puddle, the towering peaks or the deepest oceanic abyss. And it’s all my family, kin in the truest sense of the word, whether a massive blue whale, a virus, or the seemingly lifeless lichen on the granite in my backyard. Again, I owe this to those who have rejected the false certainty and comfort of authoritarian religion and superstition, often at great personal cost, in their quest to understand the reality of Nature. There is a really great YouTuber who goes by QualiaSoup and he has some really, really good videos on these sorts of topics. He also does a lot on critical thinking and religion as well. You might find some of them interesting and enlightening. Thank you for sharing your rainforest experience. That was just one example. I “see” and think like that all the time. I didn’t do the story justice, really, because I was writing in a hurry as I was trying to get out the door. Mardi Gras is in full swing and a friend of a friend scored us tickets to the biggest gala of the season. Carrie Underwood was the headline entertainer. It was something else, that’s for sure! I definitely like that. It resonates with my own thoughts and experiences. Thanks for sharing that. Andrey – I feel the need to share our dialogue in its own post… or… I don’t know maybe I need to start an entirely new blog called “Conversation with Andrey”. Seven years ago I stumbled into a religion discussion forum and connected with some really amazing people – most of whom I now consider my friends – and many of whom are atheists. All of these people who became my friends – whether they were atheists or “believers” – had the ability to laugh at their own foibles, listen to others, and learn something new. At the time I met these people, I just assumed most people were like that. I’ve since come to see that it was a really rare and precious thing to connect with these people on that discussion board at that time. As you point out many religious folk seem to shut off all discourse (and brain activity) when they are confronted with logic and scientific evidence that goes against their beliefs. Many of them tell us the Bible should be interpreted literally and that it should be the basis for all law and knowledge because it says so right there in The Bible. And I have found that many NON-believers tend to set themselves up as experts on how the religious think, believe, and feel – and then condemn the religious based on their own erroneous notions of them. Not all theists are ignorant, uneducated, or lacking in reason. Not all atheists are arrogant, pompous, and lacking in sentiment. I’m glad you liked my friend’s description of how he sees the world. I thought you might. I like it, too. I’d like to copy and paste our dialogue here and post it on my blog under its own title. Would that be alright with you? Indeed it is uncommon. I’ve chatted with quite a few people in my day and it has been both my experience and the experience of others. I think this is probably in large part to do with the fact that people identify themselveswith their ideas. Everybody has at least some bad thoughts and ideas. It would be silly to think otherwise. The point should be to try and discover those bad ideas and ditch ‘em. Not all theists are ignorant, uneducated, or lacking in reason. Absolutely not. Francis Collins is a brilliant medical scientist. But he is a devout Christian. One of the curious, interesting, and often maddening quirks of the human mind is ability to hold ideas in cognitive dissonance as equivalent. We seamlessly transition from rigorous, critical, logical, reasoned thought in one sphere of our lives to emotion, ideology, and feeling in a different sphere. This can be useful – I like to feel happy, warm, and caring in my fiance’s arms because I love her, not because I conducted a scientific experiment to determine that it is how I feel. The problem is that there are more times it is inappropriate to suspend that rigorous critical thinking than not. I also love my fiance because I have good reasons to do so and because I have solid evidence that she loves me as well. When you completely suspend rational investigation of the love of a relationship you can run into problems… and I would argue is why we see quickie weddings and high divorce rates (amongst many other things, obviously this is a more nuanced point but I’m just trying to convey some general brushstrokes). This love – the qualia of it – is wonderful and useful and meaningful in and of itself. But it is strengthened by the rest of my thoughts and considerations as to why it makes sense for me to vest my time, effort, and emotions into a relationship with this particular individual. And on every count, she wins. Which means I win. As Sagan once said, knowing the science of a flower only adds to the beauty of it. And so it is with religion. Collins is indeed an educated, rigorously logical, and well reasoned man. But he suspends that when it comes to his religious thoughts. Which is fine, to an extent. In the same way that a loving embrace from my fiance is meaningful and wonderful entirely in its own right, I suppose that for someone who feels the same way about their particular religion of choice is to them. Marx said that religion is the opiate of the masses and that makes sense to me – for an addict that feeling is a loving embrace as well. If that is where it ends, then by all means enjoy it! This is the one and only fleeting life we have to live so whatever brings you the most happiness and joy in it is what you should be doing. But we also do not live in a vacuum and so the costs of certain thoughts, actions, and beliefs should be considered as well. The addict could be harming others by acting dangerously whilst under the influence or neglecting family. The religious person could be pushing laws to prevent blacks from full rights or homosexuals from marrying. And the person who loves her husband and his warm embrace could be getting abused by him and staying anyways, just for that ephemeral loving embrace. To me it makes sense that the limitations of what we should be allowed to do rests at the step of the person next to us. Do not infringe on my ability to live what I consider a happy and fulfilled life and I will do the same to you. John Rawls said it best in his idea of The Veil of Igorance. We should make laws, structure society, and act individually in such a manner that we would be happy to be born as anyone in that society. If your proposal or action would make you unhappy were you magically transposed with anyone else then you should not be proposing it or acting in that way. The difficulty is that in the modern era we are in “the person next to us” is becoming a much wider sphere and will undoubtedly be truly global, if it isn’t already. I tend to take this a bit further and believe that there is also intrinsic value in truth as well. I think that in the situation where knowing the veracity of something might demonstrably lead to proximal and short-term harm, that the value of knowing that truth and demonstrating it outweighs that harm. Sam Harris makes a solid, cogent, but brief argument as to why in his novella Lying. Whilst in the short term it may cause harm – including, say, the psychic harm of stripping away the faith of an individual – it will, in the long run and overall be more harmful to perpetuate the bad idea (whatever that may be). And moreso is likely (if not guaranteed) to increase the amount of harm the longer the bad idea is perpetuated, putting a bit of urgency on the matter as well. And lastly, I think we should be cognizant of unintended consequences and act in a Socratic manner in concordance. Meaning that while a fanciful belief about an anthropomorphic god (or any other magical or purely faith-based thinking) kept entirely to oneself (such that it truly does not infringe upon “the person next to you”) is still in and of itself intrinsically a bad thing. This is because it is likely to engender magical thinking in other realms where it does matter more and does infringe on the person next to you and it also engenders it in others. Obviously, some ideas and beliefs are more harmful than others (a Muslim Jihadist who believes in martyrdom vs a Christian moderate who believes in being nice to people), which is why it stands to reason we put more effort and opprobrium into combating certain ideas over others. But in the same way that we shouldn’t ignore a single woman in the US being raped because there are millions being killed, raped, and mutilated in Africa and the Middle East we shouldn’t entirely ignore seemingly innocuous belief-based thinking. (I chose a specifically strong example to illustrate the point clearly). And that is why I am not just an atheist but an anti-theist. I remember being greatly saddened the day that Christopher Hitchens died. But that doesn’t mean there aren’t times and places to pick battles, things to focus on, and concessions to make along the way. This is an ever growing process with no specific goal in mind, save the betterment of humanity first and all life a close second. And I also think that violence is abhorrent and no matter what should never be returned in kind (there is plenty of good evidence to show that doesn’t work). Same with censorship, police state control of ideas, etc. The best – and only – tools for fighting such a battle is reasoned good ideas and a lack of tolerance for bad ones. Present good ideas, don’t let bad ones stand unchallenged, and yes, mockery. Once again it was Harris who said it well that people wouldn’t imagine walking into a job interview saying the believe Elvis is still alive because they would be laughed out of the room. Yet they can say they believe in a magical sky fairy that they talk to and helps them find their keys and expect that to be respected. But it is crucial to be clear in mocking theidea and not the person. Which, to loop us back to the beginning, is difficult since – particularly with religious thought – people identify their ideas as themselves. Oh, and just so you know, I write at about 75 words per minute and all of these posts are entirely off the top of my head and stream of consciousness, or else I would not possibly have enough time to actually put them out. You’ve been kind enough to look over a few obvious errors where my point was still clear, so thank you for that. Also, I’ve been in a horribly procrastinating mood for a while. LOL. More later. Life is really full right now, isn’t it?!! Haha, yes, I did see that. Not in person, unfortunately, but it has been widely shared. He also did the Cupid Shuffle. It is always a good thing to enjoy life whenever you can.